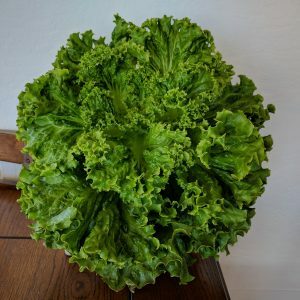 I tried to grow lettuce in soil in my indoor garden once, and failed miserably. I haven’t tried again since. It seemed a waste to dedicate a full pot for such little return, and it was easier to buy. Bulkier greens like Swiss Chard are an exception as they are great for continuous harvest, and do great in the pots. 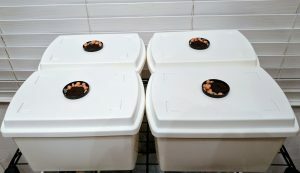 I have previously made and used an ebb and flow hydroponic system and grown many tomatoes, and herbs. It worked great, but took some work to maintain the solution, keep the aerators clean, the pump working, and was only good for a larger scale operation. I’ve since moved into a smaller space, and have tried to keep accumulations of stuff to a minimum, so I definitely didn’t want to go that route again. 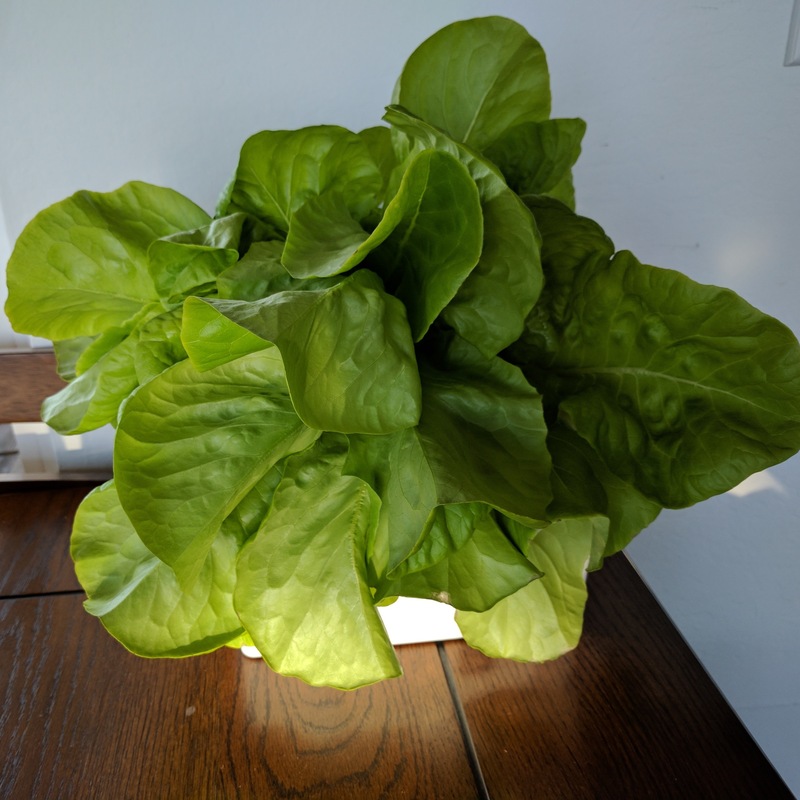 I discovered the Kratky method for lettuce production and decided to give that a go. There are no air or water pumps, no circulation, and all the solution you mix is consumed by the plant. The water level starts at the base of the net cups and as the plant absorbs the solution, the roots grow down into it, exposing the growing roots to more air. When the solution is gone, either the plant is ideally mature enough for a full harvest, or you add some more solution if you are doing a continuous harvest. I went to Daiso in search of appropriate sized containers to act as the reservoirs. Daiso is a great Japanese store that I’m lucky to have in my area. Odds are you can find exactly what you want there or something that will work for your project. I managed to find an opaque CD/DVD container that holds 4 liters, and purchased four of those. 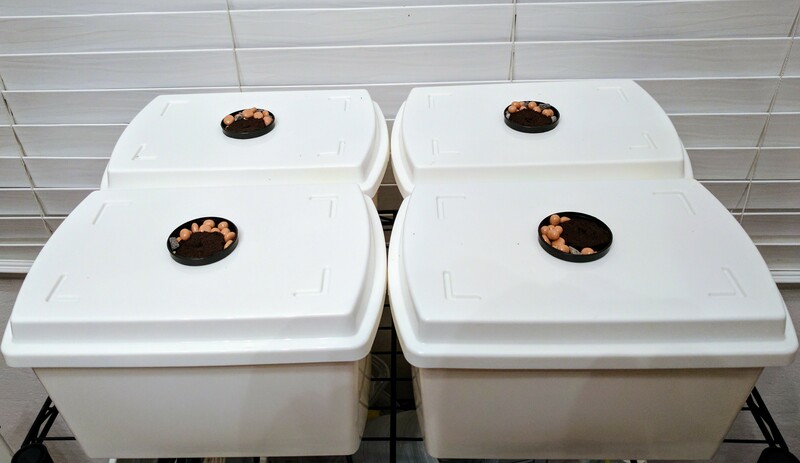 Doing individual containers will allow me to stagger the growth while maintaining optimal levels of solution for each set of plants. Ideally there will be one lettuce plant per 4 liter container. If you have multiple lettuce seeds germinate in a container thin it out to a single plant. I’ve grown multiple plants in a container and they don’t produce as well as a single plant – too much competition for space & resources. The container prep is really simple, just drill a hole into the lid of your container at the appropriate place. To start the plants, soak a Rapid Rooter until it is moist enough so that when you gently squeeze it, drops form on the surface, but don’t create a torrent of water. Then place individual seeds in a Rapid Rooter and put it into a humidity dome until it germinates. After a couple days post-germination, put the Rapid Rooter into a net cup and drop that into the reservoir. Make sure that 1/8″ to 1/4″ of the net cup is covered by the solution, if not, add more. The old formula is getting hard to come by, fortunately, MaxiGro has become mainstream and is a complete nutrient for lettuce. I use 7 grams of MaxiGro per 4 liters of water. It’s a lot easier to mix up and use. It’s one of the cleaner hydro fertilizers you can get as well. You can find the analysis in the California Fertilizer Database. No arsenic, cadmium, lead, mercury, nickel or selenium. I’m keeping this here for reference. I have broken down the formulas of each nutrient below. To mix, I pour each element, one at a time, into a container to weigh it, and then pour it into the mixing container. That way I don’t accidentally add too much of one thing into the mix since you can’t take it out once you put it in. I am mixing them into a total of 1 liter of concentrate solution (using the 16 liter formula), for easy mixing and measuring – each 4 liter container will get 250ml of solution. Then I pour out the measured solution into the reservoir and fill it up the rest of the way with water and mix it up. Check my other posts regarding growing hydro lettuce for updates and comments on specific varieties. My indoor garden got infested with whiteflies, and I had to cut everything down even though everything was going well. So I restarted, and will update again when it’s time to harvest this round, maybe in another month. The winter light makes growing slower.